This is a book of gentle, effective exercises designed to improve circulation, correct poor posture, and build muscle tone. The movements are based on traditional martial arts practices that not only offer physical benefits but also strengthen the mind-body connection.A series of photographs illustrates eachj set of exercises, which consist of dynamic sitting and standing poses that require slow transitional movements from one posture to another. Jiawen Mioa has practiced Kung Fu, Qiqong and chinese fitness exercise since he was a teenagar.For four years he studied the famous Ermei school of martial arts in China. 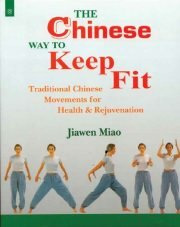 he has taught Tai Chi Chuna and fitness throughout the United States.